JUBA, South Sudan (Morning Star News) – On top of recent government demolitions of church buildings, suspected Muslim extremists in Sudan’s eastern city of Al Qadarif this month set fire to one used by a 500-member congregation, sources said. Leaders from the Lutheran Church of Sudan said they suspect a radical Muslim set the blaze that charred their building the night of Oct. 16 following a prayer meeting. The meeting was a part of a week door-to-door evangelization the church carries out annually, and church leaders said the outreach may have upset area Muslims. The church building and a guest-house attached to it were gutted, rendering them unusable, they said. Church members discovered the burned church building the following morning, Oct. 17. Chairs, tables, Bibles and pulpit were destroyed. “We have filed a case against an anonymous person,” said one church leader, whose name, like those of the others, is withheld for their protection. Calling for prayer around the world, they wrote that there is no freedom of religion in Sudan. Church members were gathering funds to rebuild. Al Qadarif, with a population of about 364,000, was the city where President Omar al-Bashir vowed to adopt a stricter version of sharia (Islamic law) and recognize only Islamic culture and Arabic language after South Sudan seceded in 2011. In Omdurman, opposite Khartoum on the Nile River some 410 kilometers (250 miles) from Al Qadarif, the Lutheran Church of Sudan also lost a building to demolition by local officials on Oct. 21. Local authorities said they tore down the building because it was located in an area designated for business. Area Christians said they did not accept this rationale as a mosque stands nearby. Karari officials had told church leaders that they would not demolish the building but later gave them 72 hours’ notice to prepare for its destruction, church leaders said. Sudan since 2012 has and expelled foreign Christians and bulldozed church buildings, usually on the pretext that they belonged to South Sudanese. They have also raided Christian bookstores and arrested Christians. Sudanese authorities on Feb. 17, 2014 demolished a church building in Omdurman without prior notice, area sources said. Bulldozers accompanied by local police and personnel from of Sudan’s National Intelligence and Security Services (NISS) destroyed the Sudanese Church of Christ building in the Ombada area of Omdurman, they said. 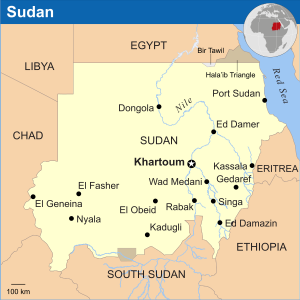 On Aug. 24, 2014, NISS agents padlocked the building of the 500-member Sudan Pentecostal Church (SPC) in Khartoum, which housed the Khartoum Christian Center (KCC). Sudan ranked sixth on Christian support organization Open Doors’ 2015 World Watch List of 50 countries where Christians face most persecution, moving up from 11lth place the previous year.